Finance Minister Edward Scicluna vigorously denied accusations that Malta was a tax haven and declined to discuss Panama Papers-related concerns with MEPs this morning, as he faced a grilling by members of the European Parliament’s economic committee. Speaking at a meeting of the committee on economic and monetary affairs in Brussels, Prof. Scicluna admitted the Panama Papers fallout “raises governance questions” but put off addressing MEP concerns, saying he would be delving into the matter during an informal meeting scheduled to take place in Malta next month. Pressed by ALDE MEP Petr Jezk to acknowledge that the Presidency country should “lead by example” and that Malta’s failure to adequately address Panama Papers concerns reflected badly on the EU as a whole, the Maltese minister and sitting ECOFIN president deflected. “Just watch the first few weeks [of the Maltese Presidency] and you will see the result,” he said. 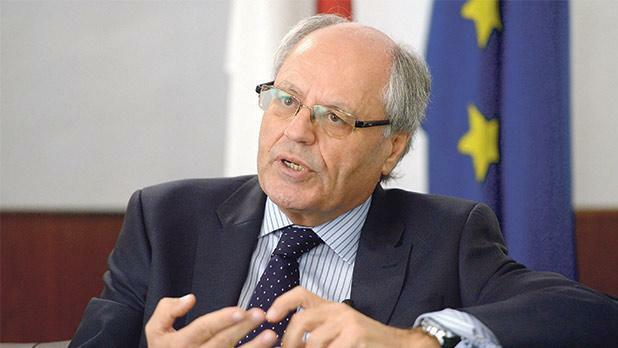 Prof. Scicluna dismissed claims that Malta’s low corporate tax regime was “neither fair nor European” and said that likening Malta to a tax haven was completely wrong. The Finance Minister noted that Malta had gone onshore more than two decades ago, in 1994, and was fully compliant with international tax transparency regulations. He emphasised the "large number" of cases investigated by local tax authorities and said MEPs who likened Malta to a tax haven "did not understand the [Maltese taxation] system." MEP Greens have made no bones about their distrust of Malta's financial affairs in the past, with the grouping having released a report openly accusing Malta of being a tax haven earlier this month. Challenged to justify Malta's decision to back proposals for a registry of companies' ultimate beneficial owners to be made available to member states' tax authorities but not the general public, Prof. Scicluna insisted transparency had to be balanced against data protection concerns. Prof. Scicluna also used the meeting to announce that the Financial Intelligence Analysis Unit had identified a new director, following the resignation of Manfred Galdes last year. A “highly qualified and experienced” individual had been identified and the appointment would be announced soon, he said in response to an intervention by EPP member David Casa. Asked by Mr Casa whether the government would be making an FIAU investigation into Panama Papers-tainted minister Konrad Mizzi public, Prof. Scicluna said that Maltese laws forbade the FIAU from publicising individual cases, or even having the FIAU discuss individual cases with the government. Mr Casa’s attempt to get Prof. Scicluna to discuss Malta’s tumble in Transparency International’s corruption perception index was cut off by committee chairman Roberto Gualtieri – reelected at the start of this morning’s meeting - who said Mr Casa had used up his allotted time. Replying to a question by United European Left (GUE) MEP Fabio de Masi, Prof. Scicluna said that Maltese tax authorities had recently concluded investigations into Swiss Leaks revelations and identified just over 100 cases stemming from Panama Papers revelations. “The first 33 investigations are ongoing,” he said. EPP MEP Werner Langen noted that the European Parliament's tax avoidance and anti-money laundering committee (PANA) was facing a lack of cooperation from some member states. Would the Maltese presidency push for full cooperation, "or follow Luxembourg's view and do as little as possible?" Prof. Scicluna replied by saying that it was up to individual member states, not the EU Council presidency, to cooperate with the PANA committee. Prof. Scicluna told the committee that that Maltese Presidency was keen to explore ways of helping North African countries “which are the gateway of economic migration,” and suggested involving institutions such as the World Bank and European Investment Bank in any eventual projects. Prof. Scicluna told MEPs that Malta favoured growth-friendly budgets and sound fiscal policies, and called for increased public investment "where needed and feasible". S&D MEP Alfred Sant argued that existing rules encouraged member states' finance ministers to cut public investment to ensure they balanced the books, and warned of the danger of doing so. In reply, Prof. Scicluna said that Malta was keen to ensure that public investment was of a high quality. He declined to discuss specific mechanism, saying that "things must be discussed within a framework". Brexit negotiations were raised by several MEPs, and Prof. Scicluna admitted that the process would be painful for all sides involved. “There’s a motorway, and we’re going to block it,” he noted. He said Malta was keen to play the role of honest broker, and was eager to give appointed negotiators room in which to operate.